Just some random thoughts while picking pepper last night: How has everyone faired with this past summers crazy weather? 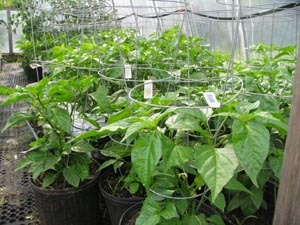 Even though we are growing our peppers in the green house our plants growth rate was very stunted for June and July. I believe it was simply a total lack of sunshine. Once the weather changed in August however the plants took right off growing and filled with lots of peppers. Now they are starting to ripen however the process is the slowest I have yet to see. Plenty of peppers not very many ripe! 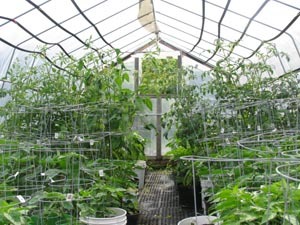 Yikes, so I have been closing up the greenhouse during the day to increase the temperature in hopes of expediting the ripening process. Anyone have any other creative suggestions? Give me a shout if you do, we would love to hear some comments on this. This entry was posted on September 23, 2009 at 12:55 pm and is filed under Culinary Information with tags Food, hot peppers. You can follow any responses to this entry through the RSS 2.0 feed. You can leave a response, or trackback from your own site.